The last thing a homeowner wants is to spend a bunch of money on a beautiful backyard but it to be riddled with mosquitoes. It is no secret that mosquitoes carry carry many diseases. Diseases including malaria, West Nile Virus and heart worms. Checking your jobs for low lying areas and offering homeowners a solution to their puddling yards is a great service to offer. According to the Centers for Disease Control and Prevention, it only takes one week for standing water to turn in to a thriving breeding habitat for mosquitoes. One question you should always ask a homeowner when starting a job is if they have drainage issues in their yard. Not only will this save you and the homeowner a headache later no during the project, but it also means more money in your pocket. Also, keep your eye out for standing water when you are mowing and maintenance a yard. A once a week mow could turn into a big project client. In addition to the hazards of standing water, they are also an eye sore. No one wants to stare at a puddle in their grass or landscape. 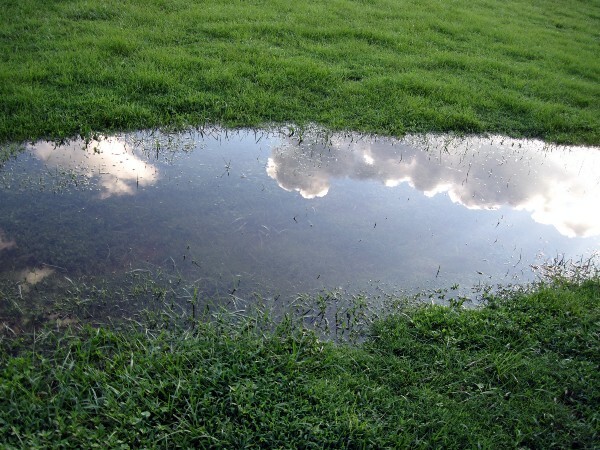 Follow the following steps to resolve your client’s standing water issue. Whether you were called out by a homeowner to fix the pooling water or you found it on your own, you want to identify all the troublesome spots. Low areas in the yard are the most common culprits of standing water. Do a slow walk through of the yard and hardscapes to check for water. Keep in mind that in cases of really hard rain, the issue could be with the sewer drain overflowing not with the yard. In most cases yards and landscapes shouldn’t have issues retaining and funneling water off the property. Water lingering along the foundation of the house, patio and driveway is also any indicator of a drainage issue. Shallow water is a breeding ground for mosquitoes, fix the problem sooner rather than later. Clogged gutters and downspouts are an easy fix. Although sometimes the problem is more extensive. Also look for other muddy and flooded spots on the property for signs of further drainage issues.Dead grass spots and gathering bugs such as mosquitoes are also other indicators. Standing water can occur in one spot or all over a property. Identify all the problem areas to best identify the source of the problem and develop a solution. Contact your local WCC Representative will questions about drainage issues. Catch basins and dry wells are two common ways to solve standing water issues. Catch basins are designed to trap sediment, debris, contaminants and pollutants so that they cannot enter drainage pipes, and are installed beneath downspouts. Dry wells are underground structures that collect and retain runoff and are typically a round plastic container with holes in it to allow water to seep slowly out and return to the groundwater. Placing drainage solutions underground not only minimizes the risk of mosquitoes breeding in standing water, but it can also preserve the visual appeal of your landscape. Wolf Creek supplied drainage by NDS to help with any of your drainage issues. Contact us with questions. Irrigation is great; but sometimes it causes issues. Watering landscapes and plants with traditional overhead sprinklers will result in over spray that will drain down and puddle at the base of a slope. To reduce standing water, try installing dripline, single point emitters or low volume sprayers. Pair an alternative irrigation solution with proper drainage and your client’s water issues will be a thing of the past. Other benefits of drip irrigation include: minimizing soil loss and erosion and preventing harmful water logging and salinization where excessive salts accumulate in the soil. Solving a standing water problem starts with understanding the unique features of a property and eliminating the most likely trouble spots. Once the cause of a standing water problem has been identified, it’s critical to act quickly and effectively to address the issue before an aesthetic problem becomes a health hazard for customers. An interesting article: "The Wrongs of Standing Water". Here is the website link: http://wolfcreekcompany.com/wrongs-standing-water/. Thank you.